KANSAS CITY, Mo. 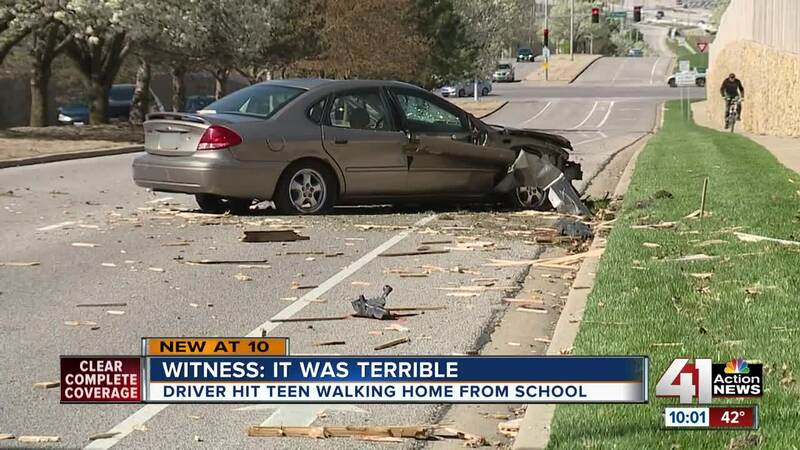 — A teenager is in critical condition after a car lost control and drove onto a sidewalk Friday afternoon in Overland Park, police said. According to Overland Park Police Ofc. John Lacy, a vehicle went off the road near 127th Street and Switzer Road around 3:15 p.m. and then hit a 14-year-old girl several blocks away near 123rd Street and Switzer. The car eventually crashed into a fence near 121st Street and Switzer. The girl — identified Saturday as Oxford Middle School student, who we are not naming in accordance with 41 Action News policy, in an email from the school to parents — was walking home from school, Lacy said. She was transported to a hospital in critical condition after the incident. Police and the school said the girl remained in critical condition Saturday. The driver of the vehicle also was transported to a hospital. He was released Saturday. The investigastion into what caused the crash was ongoing. Anyone with information is asked to contact Overland Park police at 913-895-6411 or the TIPS Hotline at 816-474-TIPS. A community gathering in support of Rumple and her family, which has requested privacy, is planned for Sunday evenning at Oxford Middle School.